Can anything good come out of Brussels? And now with Zionist Jewry’s — headed by AIPAC and its countless powerful Lobbies throughout the Western World — latest personification of evil focused on Iran’s President, Mahmoud Ahmadinejad and its Supreme Leader, Ali Khamenei, Jewry’s weapons of economic mass destruction have found a whole new target. You see, the so-called “nuclear threat” that Iran supposedly poses toward Israel, (and of course the entire world as well), is just a cover for Jewish Finance Capital’s efforts to delay…emphasis on delay…the end of the dollar as the world’s reserve currency, at least until they can secure control of a brand new one. It’s the threat of Iran’s oil exports traded in the various currencies of the BRICS nations—Brazil, Russia, India, China, South Africa—that poses the real threat to the International Banking Cabal, at least until Zionist Jewry can figure out a way to gain total control over the BRICS nations. You see, just last week, the leaders of the BRICS nations met in New Delhi to deal with the implications of America’s latest sanction against Iran. A world-threatening sanction at that. By banning Iran’s banks from using member-owned “SWIFT”…the way money in international trading is sent from bank to bank…(apparently under Zionist-America control), ALL the nations of the world have been put ON NOTICE that they could very well be next. And the BRICS ain’t happy ’bout that. For this is truly Zionist Jewry’s brand new way of waging war. If bombs and NATO invasions won’t work—then “SWIFT” — Zionist Jewry’s deadly Weapon of Mass Economic Destruction, will. But International Jewry could be shooting itself in its foot. Not only have the BRICS pledged to start trading in their OWN currencies instead of the dollar — some in gold with Iran — they also agreed to form an alternative International Bank to rival the Zionist-run World Bank with an infrastructure providing for their own “SWIFT” system of transferring money from bank to bank. What does this mean for the future of Judaic tyranny? Methinks that the BRICS’ foremost nation, an emerging Russia…now a Christian country with two Christian leaders, Vladimir Putin and Dmitry Medvedev…can lead the way to an entirely New and Better World Order. I must be perfectly frank with you all. I am slowly going broke. I have to take money once again out of my own personal finances to pay the bills this month. If this keeps up then it’s bye-bye time. I do have plan B ready to go if things keep on this downward slide. I simply will not post as often. The research, formatting, texts, editing, for articles, takes a tremendous amount of effort and time. The Video Productions take multiple hours in research, texting (even though it’s brief I have to pare down to the bare essentials), and then picture hunting, video techniques, is quite draining etc AND expensive as I have a technical expert helping me. A Dedicated Server; Anti-Hacking Software; A Web Manager; Back-Up Security; A Technical Assistant; Multiple Domain Names To Prevent Pirating; Dual Internet ISPs; Legal/Accounting Fees For The Foundation; News Subscription Services; Research Materials; Video Production Costs; Etc & Etc. Bandwith EVEN for the Comments Section does cost money. HITS ARE SOARING = 10 million Hits On Real Jew News and after 1 and half years on YouTube close to 3 million Views. BUT - those who donate are a tiny fraction of the Hits and Views. If you LIKE WHAT I AM Doing and would really like to SEE ME CONTINUE then please consider helping me financially. Wow! This is really something coming up over the horizon. If nothing else, the potential for genuine competition for the Zionist Jewish Bankster Anglo-Euro-American cartel monopoly owned by the Kingdom of Rothschild. It seems to me that most of the BRICS countries also have decent quantities of gold reserves as well, with access to gold mining and production in their own territories. Working out their own international bank and system, leaves much open also to direct barter and trade in lieu of cash transactions as well, which is closer in line with “debtless,” non-fiat money, Muslim banking principles. Under state control and protectionism, these countries would retain sovereignty over their own national banks while at the same time forming up a solid Eurasian-African-Southeast Asian economic and financial commonwealth, it would seem to me. Thank you for a terrific video. The Mainstream Media has sure been tight-lipped about this new wrinkle in world affairs. God bless you, dear +BN, and my contribution is on the way. Two arms of NWO setting up for a global clash to break the world into ten superstates, perhaps? SCO vs NATO; BRICS vs West… you name it, they got it. BiBi Netanyahu is already crying that the economic sanctions imposed by the U.S. aren’t ‘doing’ enough to Iran. That may be a good sign but it’s kind of early to be complaining. I thought Hillary gave the ‘warned’ countries until the end of June to comply. But, if setting up a competing world bank is the defensive option for these countries, it may quickly turn offensive and things will get even uglier. Can the QE3 digital unit not expect to take a beating from a metal backed unit on a transparent playing field? If this was poker…it’s not even a good bluff. And with BiBi at the table…someone will pull out a gun before the hand is even dealt. Wow, this is unbelievably good. And you are Christian as well, and a monk! 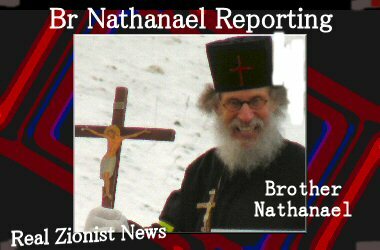 Wonderful, Brother Nathanael, wonderful! The courage given by knowing that you are doing the right thing by Christ. Jewry has a strangle hold on the countries with HUGE debts. The countries that produce a surplus are trying to insulate and isolate themselves from the uber-parasite. BRICS, ASEAN and MERCOSUR represent a huge bloc. The Jews have sucked dry the West and are trying to move to a new host. The new prospective host isn’t blind to this. Russia and China have dumped U.S. paper. Japan has taken the HUGE step of signing up with ASEAN. China is in partnership with Saudi Arabia to build a huge refinery in Saudi. A direct slap at America. The end-game is Africa and it’s enormous mineral riches. China wants both the minerals and the farmland. There is LIGHT at the end of the New World Order tunnel. But I strongly suspect the Trillionaire JEW Bankers are NOT going to be happy. The Trillionaire JEW Bankers blackmail is no longer working. The Trillionaire JEW Bankers are going to launch World War 3. DEPLETED URANIUM coming to South Africa soon. Understanding the global monetary system is impossible, because it is rigged. 1. It was invented to steal. 2. It will eventually collapse. The collapse is sped up by BRICS bartering without the use of the Dollar. The only problem is that this is grounds for war to the US. The US has “liberated” many countries that tried to circumvent using the Dollar. As attack dog for the “Interenationale finanz Juden” the US is ready to start WWIII. In the Old Testament we see the patterns of what is going to happen in the New. We see Joseph, the glorious son of Jacob, envied and sold by his brothers into Egyptian slavery. We then see Joseph, vice-sovereign of Egypt, “capturing” his family, out of necessity due to the famine, into the same place he was sent many years earlier. Similarly we see the Holy Rus, the “glorious” Slavic nations [what else does Slav meaning? ], literally betrayed by the rest of the world into the hands of modern Egyptian slavery back in 1917, now drawing the rest of the world out of spiritual famine, yet head of the same structure of globalism that was meant to destroy and undo Christianity. Was it not intended for the Church to be Universal? Is it no coincidence that prophecy has it that in the last days it shall be a fair colored nation that shall be the forte of the Christian world? Are you trying to pass off a joke or are you really saying that Iran is a Mossad instrument? What is your purpose when suggesting that the countries, whose policies are providing hope for many people and which policies are driving the Jew to the brink of insanity (the Jew defines these policies as currency war and he knows this can lead to the break down of his empire in the West)? What purpose are you then following in saying all this is just a spectacle set up by the Jews? Some might be excused for saying that you are trying to prevent people from recognizing reality, and live instead in a fearful Jewish-matrixed fantasy world, from which there is no escape. This is truly a Jewish aim and fully in line with their false flag operations and so called psy-ops. What is it that motivates you, my dear fellow? You are spreading propaganda emanating from the Jews and found on shill-sites, you are trying to further the Jews aims to confuse people and in your script you assert exactly the opposite of what Bro Nat is saying. What makes you think that just on this site there would be people falling for what you say? Explain yourself - if you can! Brother Nate, you are a Godsend and I just sent out all the singles in my wallet yesterday. It’s not much, but I hope it helps and hope others do the same. Everyone of your articles are just so inspiring and invigorating to read. Please Dear God, please help us conquer these monstrous demons, please give more power and strength to Brother Nate to carry on his work. It would seem to me that the strangle hold the Jews have on the world that any ray of sunshine glimmer of hope would only be created by them. Don’t they still have Jewish assassins in Russia? What could happen if Russia said Jews we want you out? Don’t Jewish International bankers still loan Russia money? Wasn’t that the only reason Russia lost the war with Japan in 1905, because Jews refused to loan Russia money? I would think it would be impossible to pull a fast one on the Jews. Since they used money in the past to control the situation, has that changed? Since the Jews were able to assassinate four of our presidents and scores of reporters and politicians and able to finance all the wars are you saying their control is weakening? I mean if not for Israel we would have no trouble in the Middle East. Israel is the only country that could shoot people bringing supplies to poor people and get away with it and then to shoot people in camps and able to stifle any investigation. I think people have overlooked Africa. You could irrigate Africa and feed the world. In fact it would be good to irrigate Africa. Maybe it would cut down on the desert conditions a few degrees and mayve the hurricanes won’t be so frequent and powerful off the west coast. I would imagine imagine Africa could be bought for pennies an acre. China is wise. Africa is not developed and the price of the land wouldn’t factor in much infrastructure. If China gets Africa they’ll have vast amounts of land to grow food and certainly endless amounts of natural resources and they would not have to contend with cold temperatures. The deserts look like nothing, but Libya found an ocean of crystal clear water under their desert and it made them a target right after they had it all pumped together. Libya was going to be able to supply their neighbors with endless supplies of fresh water. This the elite could not allow. I’m sick and tired of them telling us we are all equal and then go to the Middle East and treat those people like dogs. Nobody else can get people to donate anything, either. They sell T shirts and coffee mugs and books. You could offer someone a T shirt for $20 and you pay $8. I’m sure if everyone gave you just a dollar it would make a huge difference. I would make it easy for them just send $5 a year and they could mail you cash money in a nice little card. They smear Iran with their press 24/7/365. They threatened Iran with genocide and environment pollution (”regime change”). They cut off the money supply and the possibility to transfer money. The situation is comparable with 1941 where US terrorized Japan to provoke an attack. But this time it won’t work, Iran is not stupid. The Iranians won’t do the Jews and their poor horse the favour of a first strike. They can´t wait any longer. They are not afraid of the (alleged) nukes, they are afraid of the free Iranian press which can broadcast uncensored news around the planet. Their financial weapons of mass destruction is swift and also CDs. Volume around 60 quintillions worldwide. They will ignite that bomb as plan B if something goes wrong. Actually I think they are going for plan B.
Arjan: “Understanding the global monetary system is impossible, because it is rigged. Not eventually, it WILL collapse. This is safe as the bank of England. The Jews will pull something out of the rabbit’s hat to counter-punch this move by the BRICS bloc. Interesting (and inspiring ) interview on Spingola today regarding the Middle East and Israel. Israel is playing a dangerous game of chicken, and as the party interviewed implied….Israel’s arrogance and self-defined superiority may create the perfect “blind spot” tunnel vision that will take it down and take it out. IMHO, Israel has cornered itself into the “LOSE-LOSE” point, which is good for the 99.99% of the world’s Goyim. I have to point out that even if things go our way in Israel, there are many influential Jews in Jew York City and London. These two cities have harbored many evil Jewish Zionists and others over the years. Both cities played important roles for WWI and WWII and other events. They are the Jewish nests. If Israel goes down, something bad will happen elsewhere. The Rothschild family banking cartels must somehow be terminated. London is the vortex of pure evil for International Jewry and their whores the Freemasons. Thanks again for informing us, +BN. And, on this weekend (Western Easter), I’d like to also stress to us all that we’ve always been given a ‘choice’ between ‘Two Jesus’, if you will. When Pontius Pilate asked The People, “Who do you wish me to give to you, Jesus The Christ, or Jesus Barabbas?” - sadly, and quite ‘willfully’ both they, and we, often choose the wrong Jesus. We ‘choose’ time and time again the murderer, the insurrectionist (because he most suits our carnal/fleshly/willful purposes of self) rather than choosing The Christ. The OBEDIENT Son, Who is to be our example, our Firstfruits, over not only the physical ‘grave’ but, the Spiritual ‘grave’ as well, for by giving His ALL in OBEDIENCE to the FATHER, we follow, we are to FOLLOW His Example, which truly resurrects us ‘new every morning’…or, Not. Again, it’s our daily choice. And, knowing well that it’s ALL ABOUT CHOICE, please know that every time I’ve ‘chosen’ without consulting Him first, my CHOICE is invariably wrong. Your ‘Thorpie’ - from the lovely coastal shores of the Southeast’s Outback. South Africa has been labeled by the US as a terrorist nation. South Africa has been labeled by the U.S. as a “terrorist” nation. I received the message below from a friend in South Africa. It hit me pretty hard for the following reasons. Second, it is well known that there are IDF and American troops in Central Africa with a large contingent in Uganda. Third, there has been bombing going on in Somalia, Yemen and the Sudan. Fourth, last month I personally spoke with a documentary film maker who had been in South Africa just recently. He told me that he witnessed the offloading of a Nimitz class U.S. aircraft carrier. The ship was stationed offshore and the Navy used large helicopters (probably Sea Kings) to transship large crates inland to a base that he called “Silver Mine.” (He watched the whole operation with a 300 millimeter telescopic lens). The shipment, (whatever it was) was then trucked by military convoy to a base in western Botswana. According to this contact, (below) South Africa is providing support to Iran and South Africa has been labeled by the U.S. as a “terrorist” nation. It should be noted that China also has a huge commercial presence in Zimbabwe and S.A. They also have considerable investments in natural resources. We can expect American forces to attack South Africa from their bases in Botswana. Apparently Russia has given the Americans plenty of warning. Now Obama says he does not want to know of Israeli advanced plans to attack Iran. But they will assist the Israeli state in case of an Iranian retaliation. That will bring Russia into the conflict as well as China. South Africa has sent helicopters to defend Iran and has sided with Iran; now the country has been branded a terrorist nation by the Americans. Thus, in practical terms, we are at war with the United States as well. We must be on DEFCON 1, when the actual war starts. We can expect American forces to attack South Africa from their bases in Botswana. We can also expect American air raids. They had threatened us back in 1994 with war, if the country was not handed over to the Blacks. But we have a covenant with God, and as in Bloedrivier, there will be another Battle of Blood River, which will be the final battle, when our enemies will finally be defeated and wiped out and driven away from here once and for all. So, from a South African perspective, we must see ourselves now at a DEFCON 2 state. The Middle Eastern war was supposed to have started already save a few American officials who had frustrated Obama in his quests. We do NOT want the JEWS Depleted Uranium in AFRICA. I read your insightful posts and videos although I have never made any comments till today. All your views and opinions about the Jewish cabal that has the planet in it’s evil grip resonates exactly with mine. I have an opinion which I want to express here. I believe the holocaust is being exploited by the Jews to equate the deaths among them in WWII to be of a greater magnitude by way of suffering than the suffering of the Gentiles who had a far greater number of deaths among them and which was equally horrible, as any death in war is a very painful one. Why only the gassing, even if it really happened in the manner the Jews describe it, should be any more horrible than the deaths of the Gentiles is hard to understand. But it can be clearly understood if the idea is to equate it on a par with the suffering Jesus endured on his death and thus get sympathy for the Jews which in turn allows them to get away with the atrocities they commit on the Gentiles. Brother Nat always has his hawk eyes on important developments. SWIFT is truly one of the main cogs of this devilish mechanism which is enslaving the Earth today. Some people believe that National Socialist Germany was attacked because Hitler decided to run his own money system independent of the Rothschild system. It may be part of the truth. What Russia and the other “BRICS” are doing might be something similar. Problem is they are way too powerful for the war-weary USA and may get away with it. Your lines are quite impressive - the world wrapped up in a few sentences. The Jews are now indeed in an unenviable position. If they don’t attack, they cannot maintain their threat and their influence will recede greatly. If they do attack they may suffocate on the piece they want to swallow. Also, the adversaries of the Jews derive their power largely from a broad supportive population base in their countries. The Jew derives his power from forged elections and disinformation, not the kind of power that is helpful in a drawn out war! I am sure there are lots of Jews that don’t feel very happy these days for their failure to twist America into the desired attack (the failure very probably being the result of resistance from courageous military men) shows that the end is near. By the way, before Adolf Hitler shot himself in military tradition, he left a message to the after world, in which he said (not verbatim): “…the Jew may have won this battle, but he will never win the war. His greed will drive him on and on until all of mankind will understand his fraudulent nature. I think the moment in time, to which Adolf Hitler referred in his visionary foresight, is closer than many people may realise! Africa has the natural resources to harness to take care of its own development — diamond mines and many many other natural resources to process to create widespread national job, healthcare, literacy and education. Africa could look to Kuwait’s model.. It might be that the present economic crisis may turn out to be a blessing in the long run, bringing the moment of Truth and Liberty closer. As is known, Germany in 1933 was a bankrupt nation with 6 million of jobless and another 6 million partly employed. A similar situation is fast approaching, not only in the US but in the West in general. I believe that this process WILL repeat itself and we will win the war of which AH was talking. “We need a dictator who is a genius, if we want to come up again! I’d like to see more conversion of nuclear stockpiles into domestic electricity…that would have some real consumer benefit. aangirfan.blogspot today reports Putin Helps Nato. kennysideshow.blogspot reports how Putin Fails the 9/11 Litmus Test. I fear he is a gatekeeper for the global mafia. Someday I plan on sending some support. I know you are doing all you can Brother to save souls and wake people up to the evil of anti-Christian Zionism. Don’t people know that the four horsemen are ready to be unleashed? Over 1.5 billion people will die in the next world war. But we must keep faith until the return of Jesus, no matter what the Zionists try to do to us. I’m not sure what the concern is, other than some attempts at muddying the waters around Putin and long-standing American-Russian relations with really silly, provocative titles. Putin fails the 9/11 Litmus Test? What is that? I read the August 11 2011 quote that is supposed to prove “Putin fails the 9/11 Litmus Test” to kennysideshow’s satisfaction, and why it is decided to now make this an issue in April 2012 is beyond me. Anyway, apart from the fact that Western media has a very merry time translating something dishonestly, full of innuendos, and with intentional editorializing spin for gray propaganda purposes, assuming that this is even an accurate quote, it is far from proving much of anything. As one friend on a student visa studying to become a computer engineer, and banging his head against English for two years said to me, “I’m beginning to like English, it is much more direct and to the point.” He was also beginning to “think” in an American English linguistic pattern rather than a Russian one. When it comes to publicity and news reporting about political and diplomatic affairs, the Russians in general, and Putin and Medvedev in particular, are very careful about everything they say, especially the way the West distorts and agitates things. At least from what I read in the English Russian press, and what I do learn from friends, they consistently tell the truth about Russian policies, domestic and foreign, and at the same time try to put their best foot foward as well. Russia has enormous domestic problems to overcome: a demoralized society coming out of “Sovietization” of militant atheism, and 80 years of systematic corruption under the Soviet power politics along with detrimental government policies, which was further corroded with the much too hasty “privatization” and “democratization” fostered by the Clinton adminstration. Yet they have to walk on eggshells criticizing the West lest the big bully and its little evil twin go ballistic and break things, while at the same time doing a balancing act with their own volatile domestic and near-abroad situations, especially in the Caucasus areas of Central Asia, while also keeping an eye on Iran. You have to pay attention to what is actually being said, and try to deduce a “white space” where something is not being said, kind of like the white space around typed alphabet letters. Since the quote actually comes from RT, I’ll accept the translation as is. Also, keep in mind, Putin is speaking to a youth group, and was asked a surprise question. Kennysideshow asserts that Putin is disavowing 9/11 as a false flag. Putin is doing no such thing. “This is complete nonsense, it is impossible,” Putin said on Monday, responding to a question posed by an attendee of the Seliger 2011 youth forum. In short, Putin didn’t eliminate Mossad as the suspect. On the other hand, he didn’t eliminate the Samoan government either, but there is far more probable cause on the Mossad side of the scales. 9/11 an “inside job?” No, an “inside job” strictly defined by Putin as he sees it, is “deliberately done by the US intelligence services, by their own hands.” He knows a lot more than he is saying. 9/11 an “outside job?” Mossad/Shin Bet is not a part of the US intelligence services. They are operatives and agents of a foreign country. Putin didn’t say Mossad did it, but he didn’t say they didn’t do it, either. Mossad’s sanayim network, including the Zionist dual citizen Israeli-Americans, Israeli-British, numerous private actors (Dov Zakheim, Silverstein, Lowy, etc) and corporate contractors, Jew-owned media, corrupted US officials in the White House and Congress, any sympathetic to Israel and treasonous dual citizen military officers, and Judeo-Christian fellow travelers, not to mention other corrupted select members of other foreign intelligence services who are friendly to Israel. So, filling in the bubbles after eliminating “inside job” by “US intelligence services” as impossible to conceal, now we have an outside job by foreign intelligence services, like Mossad and their moles in US intelligence services committing a false flag, which Putin never denied it was. Kennysideshow put words into Putin’s mouth. Impossible to conceal on the one hand the work of Israeli foreign actors like Mossad, yet because of their interpenetration into US intelligence services, can set up distractions and roadblocks and trojan horses. How about starting with 60+ “Israeli Art Students” and “5 Dancing Israelis” who were let loose by Jewish DHS head to be, Chertoff? And, quite a bit of the US intelligence world was being stymied in their work in the run-up to 9/11. I’m no great fan of the Times, however, it makes it a lot clearer as to what Russia intends. Basically, arrangements are being worked out so that the US can LEAVE Afghanistan via Russia and several other Central Asian countries in due time, since the US has managed to destroy their access routes via Pakistan by indiscriminately killing innocent civilians. Russian private freight lines and haulers are going to make a bundle helping US forces haul out their stuff. Private freight hauling for the US into Afghanistan has already been a $billion dollar market per year since this whole mess began in 2002. Russia is also saying that the US is going to stay there and make an orderly withdrawal so as not to destabilize Russia’s Central Asian “near-abroad,” and will not be permitted to leave a mess for Russia to clean up, especially concerning the scandalous opium/heroine traffic. Much of which finds its way into Russia, originally brought in by Russian vets from the Soviet-Afghanistan war and is now trafficked by “Russian” organized crime. Putin is a nationalist, a realist, and he is looking out for the Russian Federation’s interests, first and foremost. Many honest Americans, especially RZN family, are beginning to know where Putin stands on nearly all things, even if we might not actually agree with it sometimes. If you know where someone else takes a stand, it makes it a lot easier to figure out your own. I just noticed the photo towards the end of this video of Patriarch Kirill, Putin and Medvedev. What a powerful photo of an Iconic moment illustrating the idea of Orthodox political theology of Symphonia between Church and State developed by Emperor Justinian. It looks like they are in Church before or after Divine Liturgy having a word with the Patriarch, and I was struck by how Putin and Medvedev are in a slightly submissive posture of attentive listening to whatever it is Patriarch Kirill is saying. Regarding Putin, it is important to understand that by demonizing him, as our so called politicians, these zionist lapdogs, and their associates do, not least in the news every hour of every day, we think about him in a negative way, i.e. sending out hate towards him and his colleagues. It is a form of black magic that we take part in - unaware! - where we are tricked into cursing Putin. But by thinking kindly about Putin, this noble Christian leader, who ticks all the right boxes for me - thanks to +BN - we are instead blessing him, thus helping him against the satanic forces of this world. In heaven there is peace and the ones who seek peace - not war - in this world are the righteous ones. I wish you all a blessed Easter. As always you have put yourself to some considerable trouble and submitted a detailed reply to Anti-Zionist April 6, 2012 @ 12:14 pm. I like to add a few sentences regarding two aspects of your thoughts. 9/11 = inside job of the US Government? False! This is an Israeli / Mossad job! Is there any such thing as a US Government? All is infested with Jews and Jewish agents from the Government right into the CIA. Anyone who has studied the antics of James Jesus Angleton in the sixties knows what I am talking about and there is no reason to think that anything has improved since then - rather the opposite! Regarding 9/11 one can say that all (asbestos infested) properties were in Jewish hands. With the power distribution being as it is, no non-Jewish Government Official could have decided to blow up these buildings. I would estimate that no more than a dozen top ranking US Government Officials were in on this, of whom a fair share would be Jewish. The hundreds or maybe several thousands of people needed to do pull the whole thing off were all skillfully woven into it in a sectional way and it might at best have dawned on some of them afterwards what their role has been! Having said all this, one can now analyse the over-zealous conclusions of Anti-Zionist April 6, 2012 @ 12:14 pm. Putin knows who did 9/11. So do the Chinese, and so does at least half of mankind. If Putin would say who did it and specify names, the consequence would be that the Russian Judiciary would be compelled to issue arrest-warrants for crimes against humanity. If the Russians would issue warrants of arrest against the entire Israeli cabinet, plus the entire (half Jewish) US cabinet you’ve got WWIII on your hands. There is no need to provoke this when you can observe the massive shift of power to Asia and the incredible decline of our Western hemisphere. The Chinese and the Russians know everything what we on this forum believe to know. Why should they provoke a bloody war now when all indicators show that in a few years the West may no longer be in a position to conduct a war as a result of natural collapse or decline. Against such background Putin is riding on a razor blade when commenting such questions as 9/11, but the least thing that will be on his mind whilst doing so is how our friend Anti-Zionist April 6, 2012 @ 12:14 pm might (mis-)interpret him! What an ill-informed Zio-sports commentator. In judging Putin’s stance on 9-11 one has to see that his saying who did it would’ve caused a diplomatic crisis of biblical dimensions. If he ever says what he knows, it is going to be at the moment of HIS choosing when it’ll give him MAX political profit. OR, more probably, he does play the card in the poker of relations with the US and Israel. He would’ve been a bungler and idiot had he just told it to a bunch of teenagers, and no one accuses him of being one. It looks like Ron Paul also knows that the official 9/11 line is not quite kosher (or rather that 9-11 IS kosher) but saying it now would’ve killed his chances, if any. AZ, if you think Putin is hauling US stuff to and from Afghanistan, you are most probably wrong. No free lunch in politics. Putin has to watch his tongue also because he does not want to give the “Western media” soundbites which they wold love to use against him. He knows “they” love him not and knows the way “they” had made a devil out of Hitler long before he got to power in Germany. Regarding Putin, never forget that he is a politician and not a saint (not yet at least) judge his fruits. So long the fruits have been mostly OK, and so I am behind him. Still, the closer you come the more wrinkles you see (while losing the big picture) which may explain why many well-intentioned Russians oppose Putin. The Russian language can be circumscript and deferential or direct and sharp. I would say that Russian is more complicated but also richer than English (both are my 2nd). But nobody (except poets) use a full scale of a language, so in everyday use there is no real difference. The structures of Russian and English differ a lot which is why Russians may have problems talking English straight. Direct translation of Russian thoughts into English is impossible. Also, Russians, due to their history are used to talk and write indirectly. But this is changing rapidly now. My respect for Putin is growing. There are some Jewish (?) American expat lawyers in Thailand out to convince the expat community - and the world - that the Bangkok terrorist plot was not a Zionist false flag operation. I think most of us understand that Mossad certainly was the instigator behind the Bangkok terrorist plot. Same for the false flag operation in Georgia and India. Funny how the US Embassy-Bangkok is able to put out a terrorist alert a month ahead of the incident without ever being able to pin down the perpetrators. It is incredible to me that this accursed minority - those enemies of Humanity - are, again and again, able to force the world, including the greatest superpower, to go to war and murder one another. Most conspicuously did they do it in Gulf Wars. But who can forget that they managed to provoke WW1 and 2 and force the USA into both wars against America’s vital interests? One would think that by now, the American public should have got wiser and learned the lesson. Alas, it seems that the crude propaganda and the very obvious acts of violence once again will fool the people. How is it that our people never learn from the past? Are we some idiots or what? If this were reversed and we were Jewish and this country was attacking Israel we would be sabotaging the war effort like the Jews did in Germany. They would cause strikes in the plants making the munitions. Sure we know this whole thing is bogus. We’ve seen what they did leading up to the 1991 and 2003 wars with Iraq. All our talk will mean nothing. We can’t even prove to the enlisted guys all the soldiers from the previous wars are screwed up with depleted uraniuma and very sick. Have you seen anything on the TV about the thousands of children born deformed in Iraq and Afghanistan? When we kick this off and you would have to assume it will go down by no later than the first of May. They kick off wars in the Spring. It would be hard to think Obama needs smokescreen to get the heat off his arse. With just that alone I would speculate this is going down inside of a month. This Obama birth certificate thing needs a war and when that occurs you will hear no more about it. Right now you got to believe the Jews have some last minute things to finish. The Jews have lured the idiot warships and aircraft carriers into place, and Iran has done nothing. You can imagine what the Jews are doing right now behind the scenes. Our politicians decide when we go to war. Obama just like Clinton are criminals and need something to keep us preoccupied. We keep allowing these criminals to enter the White House. They need to get the heat off of them and they murder people. I would not doubt we could have another bombing in this country and the war at the same time. Because the media would focus on the war. If you see any large military machinery being moved you should warn us in here. If you have someone in the military and they say they are about to engage in something you should warn us. Anyone in the police force would have knowledge of something about to take place. I say this because anyone who wants to leave the city could be given a few days notice. I think the US/Israel/NWO/Financial elite government(s) are calculating a nuclear standoff or even limited strategic nuclear war with Iran as the trigger. They are also preparing for a war with the American people. Witness the massive purchases of ammunition-40 cal hollow point, intended for close combat and very destructive. They are planning to kill lots and lots of people here in the US and not invaders from without. We have nukes and the military for that. High tech weapons and heavily armored domestic police for deadly crowd control. Cavity searches as a deterrent for protestors. They think they can set the BRICS back and stop their forward progress like they did in Iraq, Libya and soon Syria, Iran. They are depending on mutually assured destruction (MAD) as a deterrent to full scale war. They underestimate Russia, China and Iran’s willingness to take heavy casualties. Americans don’t have the stomach, will see through “The Plan” finally and wake up. Now they can’t have that, can they? Coming back to the original subject of this timely and important contribution of +BN, let me cite here some facts about SWIFT. SWIFT is one of the pillars of the Jew World Order. It is based in Brussels. It allows to transfer huge amounts of money between virtually every spot on Earth without PHYSICALLY moving cash. This took before weeks, and posed a real obstacle to globalization. But there is a more SINISTER aspect, largely unknown to the public. SWIFT is part of a triangle, the other two institutions being CLEARSTREAM (Luxemburg) and EUROCLEAR (Brussels). They are the “banks of banks.” Their clients are supposedly only banks, not private persons. Why are they sinister? In a most important exposé, Denis Robert and Clearstream insider Ernest Backes published in 2001 the book “Revelation$”, followed up later by Denis Robert’s book “The Black Box” in 2002. They also used the information provided by Clearstream ex-Vice President and insider Regis Hempel. Both books show without any doubt that the three companies are “A FINANCIAL BERMUDAS TRIANGLE.” In the year 2000 out of 15,000 Clearstream accounts, 7,600 were SECRET ACCOUNTS. Euroclear had 7,000 accounts, of which 3,000 were secret (not published). No reliable data are provided for SWIFT, but we may assume a similar 40-50% of unpublished accounts. What are the SECRET ACCOUNTS used for? You bet. Rockefeller’s Citibank has, according to “Black Box,” 37 secret Clearstream accounts for its Bogotá branch in Colombia alone. This tells us that these secret accounts are being used as a GIGANTIC MONEY LAUNDERING SYSTEM! Even more interesting: the Bank of England possessed 119 secret Clearstream accounts and the Bank of France 70. Can you imagine? Central banks need secret accounts! Sure, this enables them to do all type of ILLEGAL transactions, without being noticed! WHO OWNS SWIFT AND ITS SISTERS? You probably suspect already that it is in the hands of the ETERNAL JEW… Well, YES! The founder of Euroclear (in 1968) was none other than the Rothschild front J.P. Morgan & Co (see Revelation$). In “Black Box” we also read that 60% of Clearstream stakeholders are also involved in Euroclear. They also have one third of the board members in common. Many SWIFT board members are in high positions in the other two companies! ALL OF THEM ARE ULTIMATELY OWNED BY ROTHSCHILD! This is really the NERVOUS SYSTEM of the JWO!! If Europe is ever going to be liberated from the Jew grip, one of the first addresses of the patriots should be this three communication knots. Take them down and you PARALYZE the whole system. Or is it a job for Iranian hackers? Today is a GREAT day because it’s the day Jesus rose from the dead after dying on the cross to save us from our sins. Stay healthy everybody. Have a Happy Easter everybody! Thanks Minnie. Love to Brother and our RZN family on EASTER. It is nearly impossible to separate the CIA and the Mossad, Amerika no longer being an independent sovereign country but, as Joe Cortina coins, a Military/Judaic complex. Afterwards, there, other commenters have chimed in on this topic. Time will tell!! They don’t want us to think kindly of the Russians. A few years ago we had those forest fires out west that burned for weeks. The Russians have water collecting planes that will collect 7,000 gallons and will put out a swath of water 200′ wide by a quarter mile long and would have put the fires out in no time. All they asked was for the fuel burned, but our government refused them. It would have made the Russians look like humanitarians and we can’t have that and we see now Russia is going to be the boogey man once again. Is it true what they say about the B.E.A.S.T. (Brussels Electronic Accounting System Terminal) located in Brussels, and tied into the S.W.I.F.T. system? Please give links to any information on this. I read ten or so years ago about this, and the guy said this was the computer that would be used to implement the Beast system where nobody could buy or sell without 666. Ahmadinejad: That means if someone is a member of the Non-Proliferation Treaty they may be disenfranchised? And the Zionists may threaten the country — a member country of the IAEA? In principle, we are against this nuclear bomb. That is an inhuman weapon, from our point of view. And immoral. Those that have such weapons are not in the situation to use them. The time of the atom bomb was brought to an end with the end of the Second World War, and it was simply buried. The atom bomb belongs to the previous century. Those that search for something like that have stayed behind — stayed behind in history and in terms of humanity and policy. But my question is, why do the Zionists simply have the right to threaten all other people, that is my question. Is there an unwritten law that elevates the Zionists above all international regulations and laws and decrees — to enforce their rights even toward the American people, even with violence? And do the same in Europe and in Iran? Kill, terrorize, destroy? Do they have that right? Why do the European Nations support the Zionists blindly? Why must this capital and money of the peoples of Europe be spent for the Zionists, and used even for the production of weapons? Iran is not an artificial country, it is not an occupied country, we are not a regime of occupation. Iran had 7,000, 10,000 years of history and civilization, it is an autonomous country. ZDF television: Israel an artificial country? Maybe they’ll give it to Obama. Jewish logic 101: When caught telling a lie, tell two more lies. I used to attend Woodland Hills Methodist Church. Once, the sermon was given by an esteemed local guest…a rabbi. I’ve always wondered if I was the only person who was jolted by that statement — the congregation laughed on cue — I was shocked. That was twenty years ago. I wonder would it be the same today? I no longer live in the area, but I’ve never forgotten it. Somehow I missed this one. Some good news for a change! Andres Serrano’s infamous “Piss Christ” has been irreparably damaged by French Catholic protestors. Leftists were left (ha ha) to howl in anguish at their loss and accused the vandals of “sacrilege.” I kid you not. Kwai Chang, I’ve discovered that even rabbis can give you the undiluted truth when they want to. But so can the Devil. In fact the Devil tells the truth most of the time. The rabbis on the other hand…. The atomic bomb is totally useless other than for intimidation. The USA showed in WWII you can level German cities with conventional munitions. Nuclear weapons should be rounded up by Russia and destroyed. Have you ever heard of something so ridiculous as having 10,000 warheads? Russia with 6,000. If they wanted to take Russia they should have hit 10 years ago when all their stuff was rusted. Most of their bombs might not have worked like they think. IMHO, what I am starting realize about rabbis is they love to engage in a myriad of tangential intellectual discussions, which seems to form the basis of the Talmud. One of the Talmuds premises is a Rabbi got into a debate with God and won. How is that even possible if Jews believe in the same God as Goyim’s perfect God ? Thus it is Satanic self -deification to a cult-ish hierarchy. Na, na, na, nanana naaaaa, hey Jews…. On Good Friday, at my church, we prayed for the redemption of the Jews. When all their stuff was rusted.????????? The JEWS OWNED and control USA. The JEW ROBBER BARONS OWNED and controlled USSR. The JEWS were making lots of cash on both sides as usual. What about SDR’s (Depository Receipts) that are like convertible notes, that when the world bank lends money, it first starts out as SDR’s and then it is converted to the currency that that country receiving the loan uses? Is that involved with SWIFT or is SWIFT unrelated to that concept??? I figured that they would replace the dollar and all other currencies like the Euro, Ruble, etc with SDR’s instead of Dollars. So SDR’s —> Individual country’s currency instead of SDR —-> US Dollar—-> Individual loan recipient country’s currency thereby cutting out the US/Zionist Dollar middleman. Someone please explain if this does or does not make any sense or has any correlation??? Thx. The Chinese preferred the SDR (an alternative “currency” to Dollar = “a snake winding around a stick.”) The TPTB preferred the “snake-money” and rejected the idea of a “non Dollar money.” Strauss Kahn was shot down. I am not a fan of the Sephardic Jew Strauss Kahn, of course, who was shot down by the Ashkenasi elite of New York (Times) but his idea was not the worst. The videos of Dr. Wilhelm Hankel contain very valuable information. He tells you like it is and how it should be. SDR is not a bad thing - if it used for the benefit of the people. Google “Dollarbetrug und SZR” by Dr. Hankel. Or “Weltgeldbetrug” by Dr. Eberhard Hamer. I’m sorry to hear of your financial problems, Brother Nathanael. It’s ironic when the people we are opposing have an unlimited supply of money. Perhaps you should try printing it the way they do. (An alleged joke.) I have contributed and will again. You emailed about my video with me singing a song I wrote as an anthem for the Truth movement, “Here and Not Here.” You suggested I send word of it to the people who read Realzionistnews. The only way I saw to do that was to leave this comment. I will leave ways to get to the video and hear the song. I hope that anyone who hears it and likes it will spread the word about it. That’s the only way for it to become known. Many thanks to anyone who does that! Free copies of the music and the recording are available. See the text after the song. Don’t try to memorize it. One must remember that when God allowed Satan to put his Jews on our planet, it was to test us human beings. Alas! We said “NO” to God and “YES” to Satan’s Jews! We have only ourselves to blame for the mess we are in today!